Harrison & Harrison made photographic filters back in the 1930s, 40s and 50s. The cartoon man on the front page of this website comes from a Harrison advertisement for this product. I believe they're still in business, but they don't make filters for still photography anymore. At least not under their own name. It is a stretch to include this here but I'll do it anyway. This is actually an attachment for a stand-alone meter. Harrison made two: one for the General Electric DW-series, and this one which fits Weston Master IIs. The idea is that you'd stick this onto the meter and it will tell you the proper filter to use to correct the color temperature for your color film. You drop the baffle down on the Weston and it attaches via a bayonet push-and-twist. There's a pull tab (on this photo it's on top) which shifts a red/blue filter. There's also a thumb-wheel (barely visible, at top, on the reverse side of the photo) which opens/closes a gate in front of the cell. There's also a metal plate (you can read the writing through the aperture on the reverse side) which pulls out the opposite side, and it has the info on how to read the meter. What you do is this: You pull out the metal sheet so that the meter has a clear path. 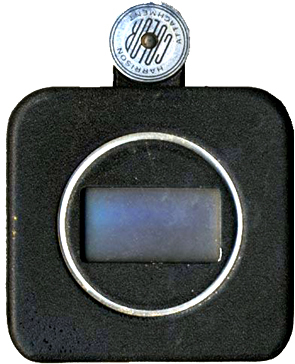 You push the slider button in all the way, and while you're holding it there, you turn the thumbwheel to open up the gate so that the meter can see what you're aiming at (I would use a gray or white card). You then close down the gate until the meter reads 3.2 footcandles (remember that the baffle is open so you're on the low scale). If you're using the GE version, you start at 20 footcandles, or if the light level is too low, you start at 10. Remember that all you did was measure the color temperature: you have to take it back off and make a normal reading to get your exposure; the bottom row of the metal plate tells you the filter factor so you can adjust accordingly.